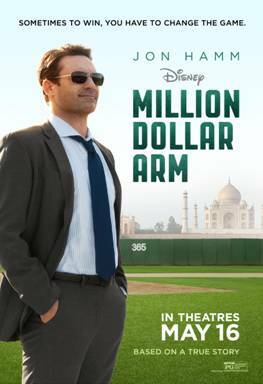 Million Dollar Arm is in theaters TOMORROW – 5/16!!! If you are not yet familiar with the story, this is a movie that is inspired on TRUE events. JB Bernstein is a Sports Agent who created a game in India called “Million Dollar Arm”. He gave athletes the chance to pitch and the top two winners of this game came back with him to the US to learn the ins and outs of Baseball. In the movie JB Bernstein is played by Jon Hamm and is probably one of these most inspiring stories I have seen in a long time. It isn’t a “sports movie” but a story about how JB Bernstein grew as a person and changed not only his life, but the lives of young men from India… in this case Rinku Singh and Dinesh Patel. As incredible as it was to interview the celebrities who acted in the movie, meeting the REAL people was even better. You will understand why I say this when you see the movie this weekend!! See some of the Q&A with JB Bernstein, Rinku and Dinesh below! Q: At the end of the movie, we see that you married Brenda and have a daughter, right? So just what’s life like for you being a dad and what kind of advice would you give to dads? JB: Wow… Delphine’s only 3 so I don’t know that I would qualify to give advice just yet after only 3 years. I’m still probably taking advice. But having Rinku and Dinesh live with me gave me a taste of fatherhood; it reminded me of the importance of family. It reminded me of the importance of being surrounded by people that you love and that love you, and being able to take pride in other people’s accomplishments. A lot of the rudimentary lessons of life came back into focus so I think in a lot of ways, I started being a parent, although it was a kind of Baptism by fire with these guys. The best advice I can give to any parent I think is to treasure your time. It’s almost inconceivable that she’s 3 years old; it’s almost inconceivable that this was 2008 and 2009 when these guys were living with me. Time goes so fast and you know, there’s no way you can possibly cherish time enough with your kids. So I guess that’s the best advice I can give. I LOVE that advice, “Treasure your time”. Sometimes I think we can forget that in the day to day shuffle of life and this movie really shows that — I don’t want to give it away but this story is VERY REAL and I think many people will be able to relate to the struggles that JB went through in one way or another. Q: In the movie, it shows you came to decide to do “The Million Dollar Arm” contest. Would you say it was relatively accurate to how you actually began? So it’s — it’s pretty accurate in that it shows the inspirations for things but obviously I’m not smart enough to come up with this idea all myself. Q: Watching this movie and seeing your lives, how does it feel seeing yourselves on the big screen? Dinesh: This is a big deal for me. I’m very happy and my family is also happy so, good deal. Rinku: [Suraj Sharma did] a great job. I mean, he’s not just a great actor, he’s also a great human. Meeting him as a person, it just really meant a lot, how he really was nice. I really liked it. It was pretty inspirational and he did a great job. And the way he actually did it, was awesome. I really liked it. That really reminded me of 2008, little Indian that I was. Q: How was it learning the game of baseball? Rinku: Yes, it really takes some time. Just like, if you took an American Baseball Player and make them become a Cricket [player], they have no idea how to pitch in Cricket, right? So that was totally different world for me coming here and playing Professional Baseball. Had no idea. It did take a year but I believe that it doesn’t matter what you’re doing in your life if you’re willing to give whatever you got inside and out, you are gonna succeed. Q: In the movie, it was a really important part when you guys left. From your own point of view, what was that like to leave your families and what kind of role has family played in your life? Dinesh: My parents were really afraid by my leaving. They say, don’t go, because this is the new world for me. I never went out so they were very afraid. Rinku: We didn’t just leave the family. Beside the family, we left our culture, country, friends, food, and we were just 18-year-old kids. Making that huge decision wasn’t easy for us. What are we gonna do without knowing anything about American culture. We don’t know language. We don’t know anybody besides JB. And our parents, they were really afraid cause we never went out to the country. And that really — that really changes our life, you know. That really teaches us, you know, whatever comes to your life, you make that decision if you’re willing to – just like I said – if you’re willing to give in and out, you’re gonna be happy for the decision you made. So I’m really proud of the decision I made being in America. It’s totally amazing. It has changed my life, changed my family life, and you know, I wanted to stay here. Q : If you could do everything all over again, would you do that? Rinku: Would love to. Would love to. I’m learning a lot. I didn’t just walk through that journey, [it] teaches a lot of things. It really make me and Dinesh like a whole people. Working “The Million Dollar Arm”, it really, for me personally, I grew up a lot from that. I wouldn’t be the man I am today if I wasn’t in here. It would, even turning 60, I wouldn’t be the person I am right now. Q: As far as the premiere goes tonight, how do you feel? Are you excited? JB: Rinku had the chance to screen the Movie for his team down in Renton. Dinesh actually was at a screening with us with the Indian Ambassador of the United States. I would probably speak for all of us when we say that this is a really personal journey for us. It’s not like your traditional business deal that I’ve done and this is something that obviously is a very pivotal point in our life. So, you know, our hope is really two things. One is that people take away what these guys have endured -persevered – in order to be successful and take away that lesson that dreams are possible in this country more so than maybe anywhere else in the world. Now, for kids to be able to look at Rinku and Dinesh as role models and say ‘Look, if these guys did this, you know, I can do anything.’ I could be a baseball pitcher and it’s that first spark of hope not just for kids in India but for kids here, for kids everywhere. They have these two guys to look at, who have done something that’s never been done in the history of the world, to go from a position of never hearing of the sport. Rinku won his first game 13 months from the day he picked up a baseball. Dinesh won his first game 14 months from the first day that he picked up a baseball. And I mean, that’s just unheard of. I’ve been a sports man my whole life, I’ve been an agent my whole adult life. I’ve never heard of anything like this. I never heard of anybody even thinking something like this could be possible. And then for my story, I think that I’m excited for people who realize it’s never too late to change. It’s never too late to — to be a better person. It’s not that I was a bad person; I think I was somewhat one dimensional. Everybody says ‘you were you really that big jerk’ and I side stepped that question because I was like, well, I didn’t feel like a jerk at the time. I wasn’t trying to be. Now, thanks to these guys, thanks to my family, I have a much different view. So I’m kind of hoping that those two things come through to the general audience. Q: At the end of the Movie, it talks about how you’re still involved in “The Million Dollar Arm.” Is that something you’re still running in India or is it a different way now? JB: Still running it in India.We’ll start our 3rd Season this Winter. Our first season, we saw about 38,000 kids. This year we’ll see half a million. So yeah. I mean, and Major League Baseball is now playing a big part in it. I mean, you know, Disney, Simon & Shuster. You know, we have a lot more muscle to flex than just me, Rinku, Dinesh, Aash and Will. Not that the 5 of us aren’t formidable on some level but yeah. We have a little bit more muscle to flex and a little bit bigger microphone. There’s a social side to this thing that really none of us saw coming that has really become the primary focus of “Million Dollar Arm” which sounds weird for an Agent to say cause you know, that’s not– I’m suppose to be about making money. But, this is a unique opportunity we have to have almost a Social Revolution. Q : My question is for Rinku and Dinesh. Have your families been able to come to America to see your new life and if so, how do they feel about it? Rinku: No, they haven’t. First of all, it’s gonna be a big cultural change for them. And plus Baseball life is too busy. They’re not gonna like it as I won’t be able to give them time. And I really don’t want my Parents to feel that way. So I’m thinking when I’m gonna make it, I will definitely bring them over here to see. And obviously, they are talking about, changing life. They already have seen enough, since we’ve moved to the States, and going back to India, they already have enough how much we have changed and how much we have changed their life. There you have it!! Overall I was extremely impressed with all three of them, the changes that they have made, not just for themselves but inspiration for other young men in India too. Be sure to see Million Dollar Arm which is in theaters tomorrow, 5/16! 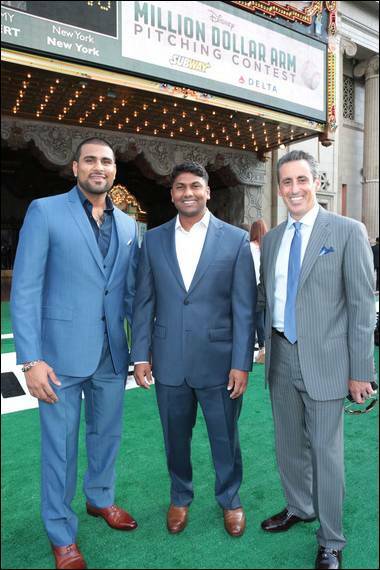 *I was provided an all expense paid trip to LA for the premiere of Million Dollar Arm and press coverage. Opinions expressed herein are 100% my own!